IBPS, is an independent organization, has received a directive from the organisations mentioned below, to conduct the staffing process as mentioned below, once a year. IBPS recruitment department will make all the preparations for taking online preliminary examination and after that to declare the result of that Online Preliminary Examination. After that IBPS will inform all the shortlisted applicants about the online main examination, declare the results of the Online Main Examination and notify the nominated applicants about the last round of interview. The round of the interviews will be led by the contributing organisations and coordinated by the Nodal Bank in each state/ UT. All the Potential applicants will have to apply to IBPS after carefully reading the advertisement regarding the process of IBPS SO examinations. 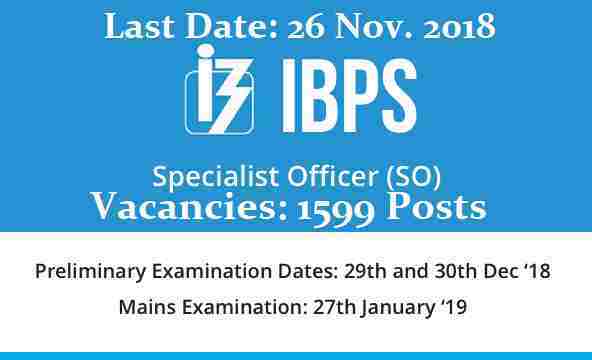 This system of IBPS Common Recruitment Process Online Preliminary and Online Main Examination, Common Interview and provisional allotment for recruitment of Specialist Officers posts in Participating Organisations has the approval of the appropriate authorities. Allahabad Bank, Canara Bank, Indian Bank, Syndicate Bank, Andhra Bank, Central Bank of India, Indian Overseas Bank, UCO Bank, Bank of Baroda, Corporation Bank, Oriental Bank of Commerce, Union Bank of India, Bank of India, Dena Bank, Punjab National Bank, United Bank of India, Bank of Maharashtra, IDBI Bank Punjab & Sind Bank Vijaya Bank. After selection candidates will be recruited as a specialist officers in one of these banks. More information related to this IBPS Recruitment is given below in this article. Those who have completed their Graduation and also passed DOEACC ‘B’ level. Graduation Degree/B.E./B.Tech in the following stream “Agriculture/ Horticulture/Animal Husbandry/ Veterinary Science/ Dairy Science/ Fishery Science/ Pisciculture/ Agri. Marketing & Cooperation/ Co-operation & Banking/ Agro-Forestry/Forestry/ Agricultural Biotechnology/ Food Science/ Agriculture Business Management/ Food Technology/ Dairy Technology/ Agricultural Engineering/ Sericulture”. Those who have a PG (Post Graduate) degree in Hindi with English as a subject at the degree level. (OR) Postgraduate degree in Sanskrit with English and Hindi as subjects at the degree (graduation) level. Those who have a Graduation degree in Law (LLB) and enrolled as an advocate with Bar Council. Graduation completed & 2 Years Full-time Post Graduate degree in “Personnel Management / Industrial Relations/ HR / HRD/ Social Work / Labour Law”. Two Years Full-time MMS (Marketing)/ Two Years Full-time MBA (Marketing)/ Two Years Full-time PGDBA / PGDBM/ PGPM/ PGDM with specialization in Marketing. Paying Method: Pay the application fee through the online mode only. Various methods for the payment of the application fee are: “through Credit card/ Debit Card/ Net Banking”. 6TH Nov. 2018 is the Opening Date to apply. 26th Nov. 2018 is the Last Date to apply.